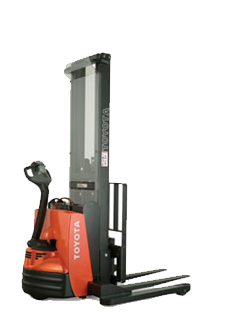 Toyota's state-of-the-art walkie straddle stacker with adjustable baselegs is a versatile, highly maneuverable, cost-effective material handling solution. Directional Thumb Wheels are ergonomically designed to enhance comfort by minimizing hand and wrist fatigue associated with twist grip. Safety Glass Mast Guard and High Visibility Mast allow the operator to clearly see the fork tips and a wider view of the work area. SepEx® Transistor Control System with MOSFET delivers smooth speed control for precise positioning of the truck, which improves operator efficiency. Fully Programmable Drive System offers precise control of the truck and reduces product damage. Electric Lift/Lower Controls on the handle are equipped with a pressure-compensated valve for constant lowering in all conditions. One-Piece Lift-Off Service Access Cover provides easy access to all major components for inspection and maintenance to reduce service time and increase uptime. Electrical, Hydraulic and Mechanical Components are logically separated for ease of service. Controller Area Network (CAN-bus) Communication Technology provides quicker, more reliable control from the operator to the drive motor with fewer components. Interlocking Mast Channel Construction with ball bearing roller design for long, trouble-free life. Spring-loaded Control Handle automatically applies the parking brake when the handle is released.